Based on Noctua's compact NH-U9 series and fitted with the award-winning NF-B9 fan and NT-H1 thermal compound, the NH-U9DX 1366 forms a complete premium quality package that provides excellent quiet cooling performance for 4U Xeon 5500/5600 (LGA1366) & Xeon E5-2400 (LGA1356) workstations and servers. The new SecuFirm2™ mounting system for socket LGA1366/1356 is highly convenient and makes the NH-U9DX 1366 a tailor-made drop-in replacement for standard Intel coolers. To make your Xeon 5500/5600 & Xeon E5-2400 systems quieter has never been so easy! Caution: The NH-U9DX 1366 can only be used on mainboards that have a backplate with screw threads for CPU cooler installation (such as the Intel reference backplate for Xeon 5500). The cooler is thus incompatible with Xeon 3500 and Core i7 mainboards that don’t have such a backplate. Please choose our NH-U12P SE2 for these mainboards. Click here for further information. SecuFirm2™ for Socket LGA1366 is fully compatible with the original Intel installation system so that the NH-U9DX 1366 works as a simple drop-in replacement. Is the cooler compatible with all LGA1366 mainboards? 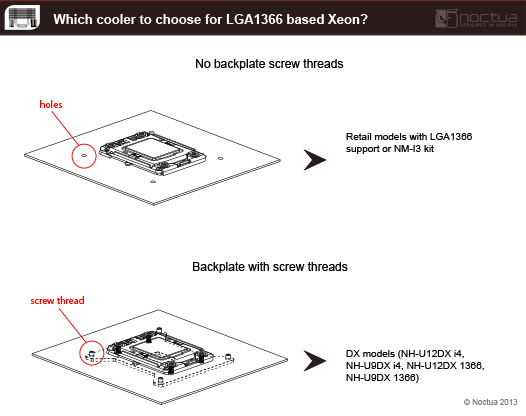 The DX models (NH-U12DX i4, NH-U9DX i4, NH-U12DX 1366, NH-U9DX 1366) can only be used on mainboards that have a backplate with screw threads for CPU cooler installation (such as the Intel reference backplate for Xeon 5500). The cooler is thus incompatible with Xeon 3500 and Core i7 mainboards that don’t have such a backplate. Please choose our normal retail models with LGA1366 support (or NM-I3 kit) for these mainboards.